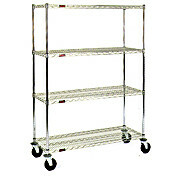 Stem Caster Cart, Chrome four-shelf cart with patented QuadTruss® design open-grid wire shelves, 63" posts, includes plastic split sleeves & donut bumpers, chrome-plated finish, (2) swivel & (2) swivel/brake 5" stem casters with poly tread. Unit shipped knocked down. Polymer cart washable with polymer tread, 250 lb weight capacity per caster. 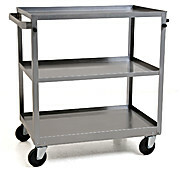 Stainless Steel Utility Cart with three stainless steel hemmed shelves welded to angle legs. 12-1/2" shelf clearance. 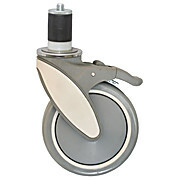 Galvanized bottom channel frame featuring four 4" swivel plate casters, bumpers, 1" diameter push handle on one end.